As the April fool’s day, there were much fun around. My favourite one was Google’s Gmail Motion. And even WordPress, it had one. 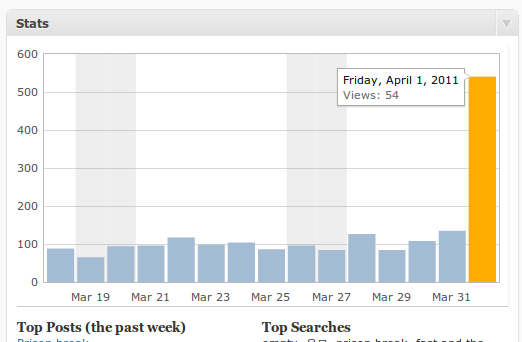 On the Dashboard, graph for today’s visitor was ten times bigger than actual. It surprised me anyway. And today is April 3rd, and God is making another joke for us. It’s heavy snow now. 만우절때 주변에 재미있는 일들이 많았다. 위의 해외리포터를 해리포터로 읽었음. 글을 읽다가 제목이 왜 ‘해리포터 전화 연결’인거지?라고 의아해 했음.